I hope you enjoy reading it as much as I enjoyed writing it. I’ll be honest with you, Its no War & Peace, but who has the time to read that! Apr 2 Revamp Restyle Reveal - The Master Suite Reveal. Oh hi, my name is Matthew Shaw and it’s my turn to show you my master suite reveal. If you’ve just joined me from the lovely Olivia Silk - Lust Living and her amazing Monochrome Hallway reveal, welcome! When Lisa Dawson and Bianca Hall asked if I would like to be a part of Season 3 of #RevampRestyleReveal, of course I jumped at the chance! It wasn’t until a couple of days later, once the mixture of shock and excitement had worn off, that the sheer magnitude of the challenge hit me! Now as I’m sure you’re all aware, I love nothing more than to decorate, and having just moved house this couldn’t have been better timing for me. But, 4 WEEKS, seriously! I have just 4 weeks to decorate one room, are they mad? I can easily spend 4 weeks just choosing paint colours! Thankfully I had a while to prepare/trawl Pinterest for inspiration. The room I decided to give the revamp treatment to was our master bedroom. 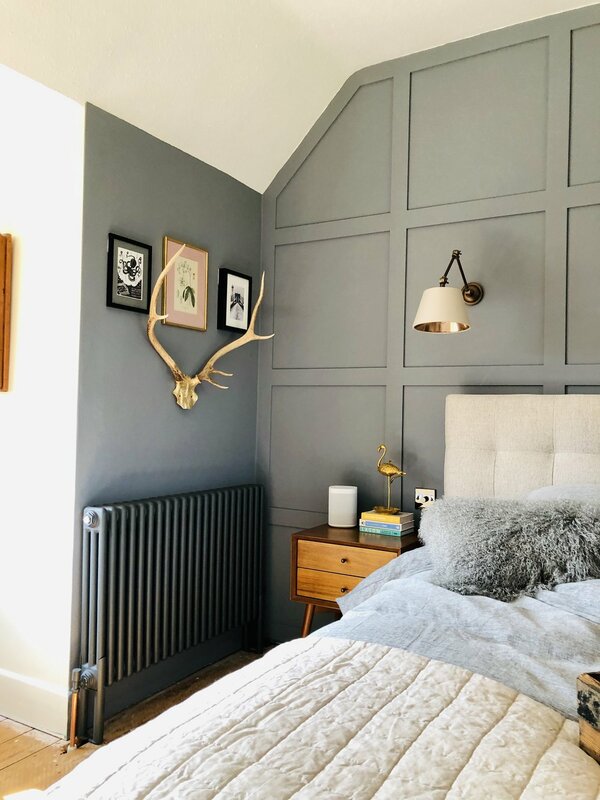 I wanted to keep things light and fresh, as in our last house our bedroom was painted dark blue, which worked really well in that space as the room was much smaller, so it gave it a cosy intimate feel. The new bedroom however is twice the size of the last one and I wanted to create something really special. It wasn’t long before the Pinterest fuelled ideas were whirling around and starting to take shape inside my head. With an idea of what I wanted to do fresh in my mind, it was time to start planning my room layout. 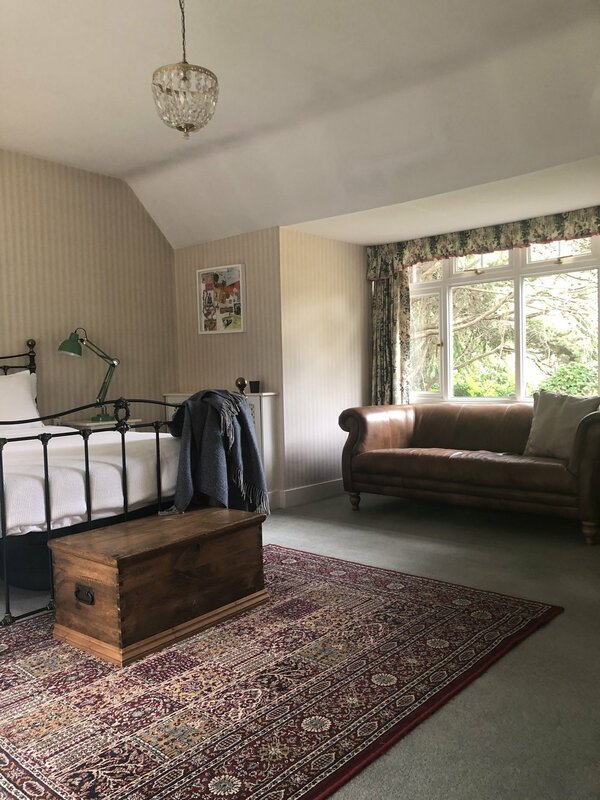 On each side of the room there are two large dormer windows, on one side I wanted to create a study area for myself, and on the opposite I wanted somewhere we could sit with a cuppa and relax/get away from the kids for 5, OK 10 minutes! When we moved in I wasted no time in making the bedroom ours, but unfortunately when you have shiny white fitted wardrobes, faded stripy wallpaper and a green threadbare carpet, there really is only so much you can do. As you can see the room has been totally transformed, and has been done so on a really tight budget. As you may have read, we are also about to undergo a massive building project that my other half says is already over budget, and so the purse strings were pretty tight with a padlock on too. Finally the room is how I have wanted it to be without the shackles of the previous owner. When it was announced that West Elm were going to be our headline sponsor for RRR, I have to admit I did let out a little squeal. My other half will testify that when walking through Kingston High Street, it is just not possible to walk past without having a look. The good people at West Elm have impeccable taste and I have always loved their use of natural materials in a timeless and elegant way. My husband is known for never being able to get comfortable (bad back and all) and he was a little worried about getting a new bed. I selected the grid-tufted upholstered tapered leg bed in stone and since we have had the new bed, he has actually had a lie in and has slept better than ever! The new linen bedding (Belgian flax linen melange) is a marvel; luxurious, warm and yet cool at the same time. You would think there should be some cool science behind that but there isn’t, it’s just linen, a hard wearing natural material that is a wonder and should be used a lot more in my opinion. 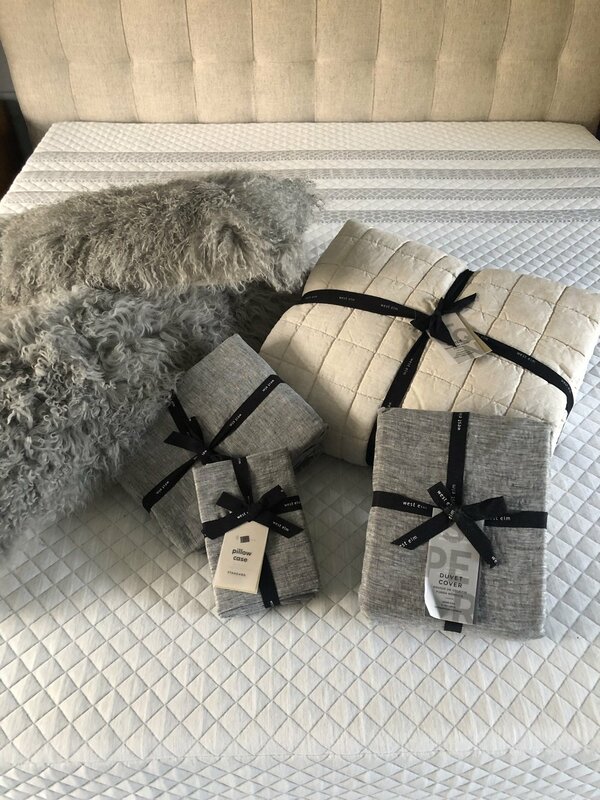 And don't even get me started on the Mongolian lamb cushions - they are so big and fluffy it is literally like cuddling a sheep! Amazing! As I mentioned earlier, we had an awful green carpet, and we had to get rid of this. A friend and I lifted the corner of the carpet and we found some fairly rustic floorboards which I knew would work really well throughout. 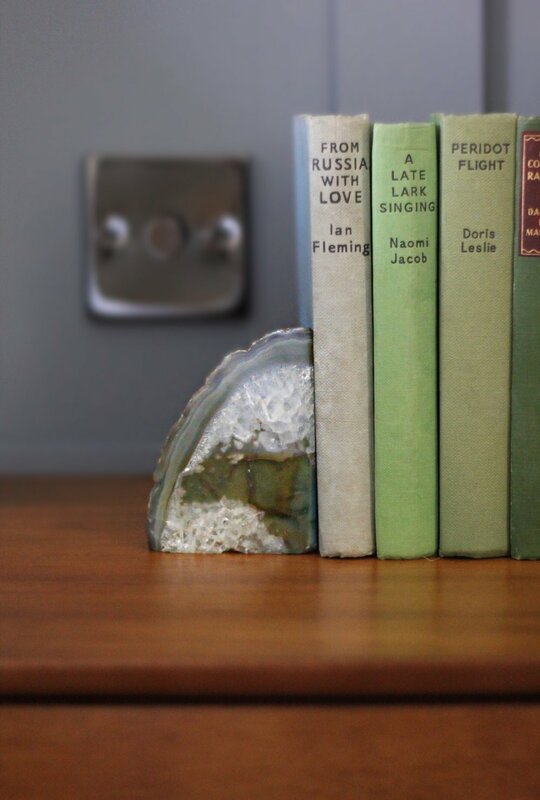 We have a collection of little hardback books which I love to dot around the place in little groups, more for ornamental value than the literary content, and these are now perfectly complimented by these stunning agate bookends. I haven’t seen agate bookends before and the weight and the polished surfaces are fascinating in themselves. A piece of jewellery for the room. And where better to display them than on these gorgeous mid-century bedside tables which perfectly compliment the bed with their tapered legs and double draws for extra storage. All of this sits beautifully on the distressed Arabesque wool rug which I chose in Midnight. It covers a significant amount of the wood floor and feels so luxurious underfoot - I just love it! The newly panelled wall (thank you Mark my amazing brother-in-law), the two joining side walls and the smaller dressing area have all been painted in Pewter., a gorgeous blue/grey tone of elite emulsion by Zoffany. The bedroom and en-suite doors and shelves in the dressing area were also painted in Pewter but in acrylic eggshell finish. This great shade takes on the light, such that with different light throughout the day more or less of the grey / blue comes through resulting in an ever changing palette, but always managing to stay true to blend with the other room features. For the rest of the bedroom walls, I have used Oyster White, a beautiful creamy/off white colour by Sanderson. For the door frames and skirting boards I used Sanderson’s Oyster White again but in the oil based eggshell. This light tone works well with the Pewter, and provides a little more warmth and brightness at the same time. As lovely as the old floral curtains weren't!, the gorgeous new floor-to-ceiling curtains and pelmets are absolutely stunning. I decided not to go for a pattern fabric as I wanted the curtains to blend in with the walls. With 25 different shades to choose from, I decided on a neutral tone fabric called Tessella by Sanderson. A lovely thick fabric which will really help to insulate the room on those colder nights. I knew I wanted to wallpaper the wardrobes and back wall and parts of the dressing area. I envisioned something that would work as a statement, but didn’t dominate the room. As soon as I found the Nuvola-Ink/Mica Harlequin wallpaper, I knew it would be perfect for the room. It is bold in its design - the pattern and the lustrous shimmer make it look so impressive, and yet the monochrome palette allows the rest of the room to sing. 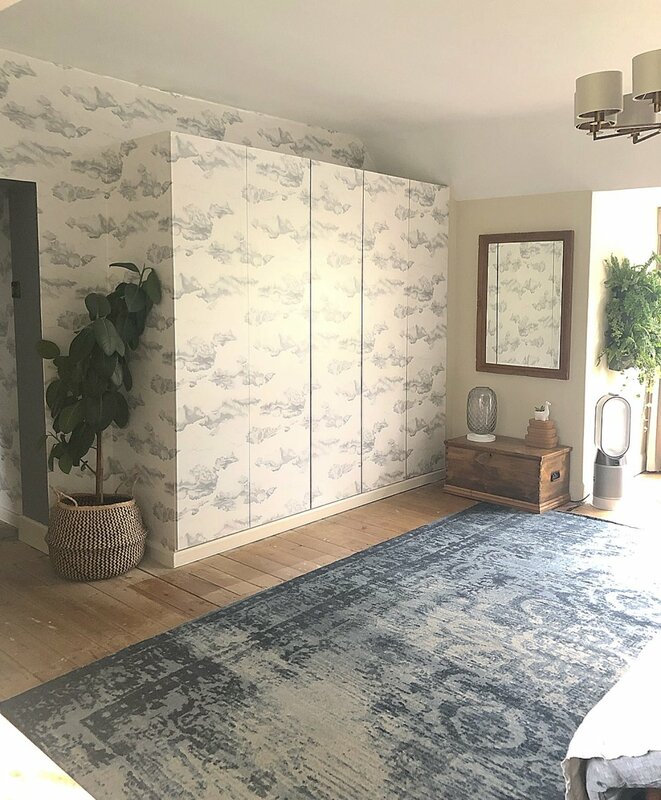 As it was my first time wallpapering MDF wardrobe doors (which have movement unlike walls), I was somewhat dreading it, but also knowing that I had to challenge myself. I was very glad the paper was extra wide, tough as anything even when pasted, and was so easy to slide around the surface that getting it just in the right position without creases forming made this job so easy to do. And all of this available in one place from the fantastic hub of the Style Library. David Hunt Lighting is renowned for making quality lighting products, and the quality really was impressive with a reassuring weight and feel that is hard to come by these days. I opted for the Rex 8-light pendant in Bronze, choosing the metal, glass and silks to create a luxury warm feel to the room. The bronze metallic shade inners help to reflect and dissipate the light which creates an even light with no dark spots in the room which is lovely for the main light. Either side of the bed I installed the Hoxton wall lights in antique bronze with an Empire Drum shade (available in a range of fabrics and finishes). I also opted to add a long, slender birdcage style LED bulb in the VIDRO large smoke table lamp to allow for maximum refraction - meaning it makes very pretty patterns on the wall. Now usually when it comes to horticulture it is my other half that dominates, but when it comes to houseplants that is my territory!! I have always loved houseplants but it can be hard to have all that you want in a room as pots start to take over. Dobbies had the perfect solution, a self watering vertical planter which is a system whereby I could create a living wall of houseplants. The husband did make up a nice compost mixture that was water retentive and yet free draining (so he informs me!) and I did the rest. It was very easy and am so so pleased with the result. Dobbies had an amazing range of houseplants in all different sizes which meant I could get loads of variety without breaking the bank. For my living wall I used twelve houseplants, choosing a variety of textures, sizes and foliage types to create an eye-catching show stopper which I love, love, love! Dobbies also had a miniature fiddle leaf fig which I had never seen before! I bought a special glazed pot for that and it is in my reading area. AO have been at the forefront of innovation when it comes to their business proposition, and the same can be said for many of their products from leading manufacturers. Dyson has likewise been renowned for innovation and cutting edge design. The new Dyson Pure Hot + Cool HP04 Air Purifier in White / Silver (which we got from AO) purifies air and can either be hot or cool using their efficient air multiplier technology. It’s possible to use the accurate thermostat, and a special quiet night setting. It really is the most advanced air management system I have ever come across, it even has a remote control that you can either have by your bedside or keep on the special magnetic top. Its like they have thought of everything and then a bit more besides! Now we are music lovers in our house, everything from 80’s pop to classical, some jazz and the odd dance beat thrown in too. What we do not love is a tinny sound, and there is none of that from the Sonos One speaker. It is so easy to connect and from such a small unit provides a powerful 360 degree sound with rich bass and clear mid tones. I have another Sonos device already at home and I can now easily connect the two to play the same music throughout, plus the Sonos One has the added benefit of Alexa technology which is incredibly handy for all the family. I am in love with this fabulous chair from Flokk for my study area. It is possible to customise the chair with countless options on the chair legs, the body and the fabrics. This one is from the Flokk RBM Noor range and I went for a tone that would match in well with the Pewter painted walls and panelling, and has really helped to balance the room. The Flokk chairs and furniture ranges are exceptionally hard wearing and are made to last. More importantly, it is ridiculously comfortable to sit in! A really funky company that pushes the boundaries, but does so with quality underpinning it. So there you have it! My full reveal in all its glory - I hope you love it as much as I do!? I’d like to say a huge thank you to all our amazing sponsors who helped make season 3 of #RevampRestyleReveal possible. I have linked them all below. Thank you all so much for taking the time to follow me on my amazing #RevampRestyleReveal journey. A big thank you also to the other nine amazing bloggers, who have all helped keep me sane through the last 4 weeks. Now it's time to hop on over the the fabulous Lisa Dawson’s blog to check out her amazing Family Bathroom Reveal! Here is the full linked list of the other nine bloggers - make sure you check them all out to see more fantastic reveals. Revamp Restyle Reveal - The Master Suite Reveal.